At the new Tompkins Financial Headquarters under construction at 119 West Seneca Street downtown, it looks like most of the structural steel has been erected, and gypsum sheathing has been installed over the skeleton. The top (seventh) floor is set back slightly from the lower levels, and will use light colored aluminum metal panels on all sides except the front, which will use black brick and stone veneer. With the exception of the rear stairwell, the side and rear walls will be faced with a tan brick veneer on the lower floors. Brick veneer can be tricky because it’s porous. Water can penetrate the brick and make its way to subsurface coatings, where moisture can do damage over time. As a result, builders have to use a water-resistive barrier (WRB) between the sheathing and the brick. This can be done a few different ways – with Simeon’s and DiBella’s, for example, they used a polyurethane spray foam. In this case, it looks like there’s a bright blue-colored vapor barrier being applied over the sheathing, probably Carisle Coating and Waterproofing (CCW) 705 or similar. CCW-705 is a rubberized-asphalt adhesive laminated with a smooth, durable plastic film. Construction crews spray an adhesive (CAV-GRIP) onto the sheathing, and then roll out the air/water barrier sheets over the top, kinda like wallpaper. These unfurled sheets are then pressed over with a seam roller to ensure it’s firmly and completely applied to the building surface. The edges of the sheets are then filled in with a liquid mastic, which is a putty-like waterproof filler and sealant. Once the surface is completely sealed by the barrier, tie plates are fastened with washers and screws, and the brick veneer is laid over the top, typically with a 2″ spacing for drainage and ventilation. It appears the brick may be underway on the western wall of the building, as shown in the first image below. Meanwhile, the bottom floor looks like a different sheathing material, some variety of Dow Thermax panels (fiberglass embedded in polyiso) from the looks of it. Based on building elevations and girder brackets, the JPW Erectors crane located at the southeast corner of the site will eventually be replaced with the last steel sections for the building. The steel decking is in, and there’s ductwork for the HVAC rough-ins. Curious to see if they’ll have the building closed up before the first snow flies. LeChase is the general contractor, and it looks like they have some union crews doing work on site – the Carpenters’ Union Local 277 and the IBEW (International Brotherhood of Electrical Workers) Local 241 have signage up, as do project team members JPW Erectors, Elwyn & Palmer (structural engineering), TWMLA Landscape Architects, and HOLT Architects. 210 Hancock is nearly complete from the outside. On the apartment buildings, the brick veneer has been attached over the Blueskin, as have most of the Alpolic aluminum pearls (dark-grey “charcoal”, off-white “pearl”, and intensely bright “EYL Yellow”). Early drawings also had lime green panels in the mix, but this was later deleted. 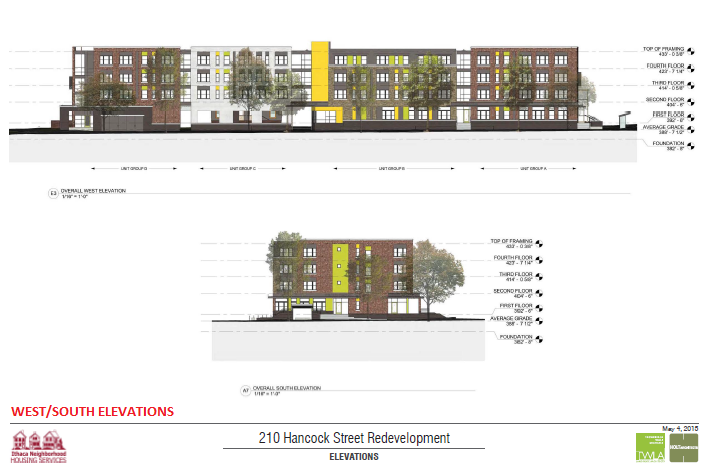 The finalized elevation drawings suggests some more yellow panels will be attached between the ground-floor windows under the awning. In fact, it’s mostly the EYL yellow panels that have yet to be installed on Building “A” and Building “B”, the southernmost pair (and the first buildings shown in the parade of pics below). The northern buildings, which are built over a ground-floor garage, are partially faced with Barnes & Cone architectural masonry – upscale and arguably more attractive versions of concrete masonry units (CMUs). The large expense currently being paneled on Building “D” (the northern end of the building string) will be more EYL Yellow, although this will be Morin corrugated metal panels, custom painted to match. The corrugated metal, which is used elsewhere (ex. top of building “B”) in blue-grey color, will add a little more visual interest to an otherwise featureless wall. According to the 210 Hancock website, occupancy is slated for September 1st. It looks like they have a one-bedroom available, which seems odd given the lottery, but the price tag suggests this one-bedroom is one of the moderate-income units (those with annual income in the $41,000 – $60,500 range). Offhand, 11 of the 54 units were designated moderate-income, in order to provide a mixed-income development. Similarly, the handicap-accessible three-bedroom townhouse (the one-story red one) is still for rent, but the other four rental townhomes are spoken for. The townhouses are mostly finished, and marketing has started for the seven for-sale units. Three are already under contract. The cutoff for maximum annual income is 80% of Tompkins County’s area median income or less – $42,380 for a 1-person household, $48,400 for a 2-person household, $54,450 for a 3-person household, and so on. 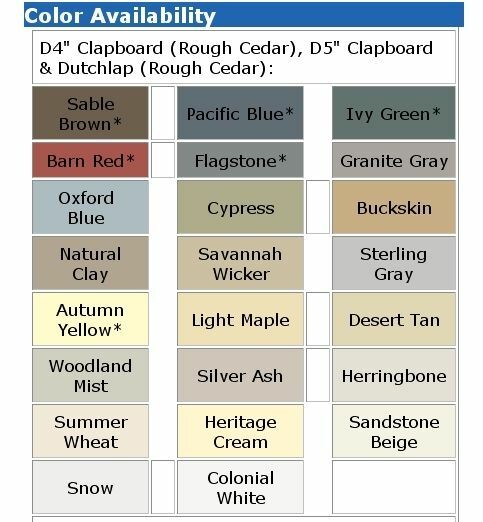 The wood lattice screening below the porches will be painted to match the trimboards, which come in three shades of Certainteed vinyl – “Natural Clay”, “Sandstone Beige” and “Flagstone”, or to the layman, dark tan, tan and light grey. Outside of the building, the new lightpoles are in. RGL Inc. of Binghamton, a subcontractor for Lecesse, is laying down the new curbing and sidewalks, with road paving/striping, landscaping and the new playground to follow. For the record, the playground will be open to all neighborhood children regardless of whether their families live in the Hancock complex. As a plus, the play area connects directly with Conley Park without the need to cross any streets. Personal aside, in the affordable apartment complex I grew up in, June 25, 1997 was one of the most memorable days of my childhood because that was when they replaced a field dumpster pad with a playground — and I can remember how absolutely packed it was for weeks afterward. 1. Quite the sight in the latest Tiny Timbers update. 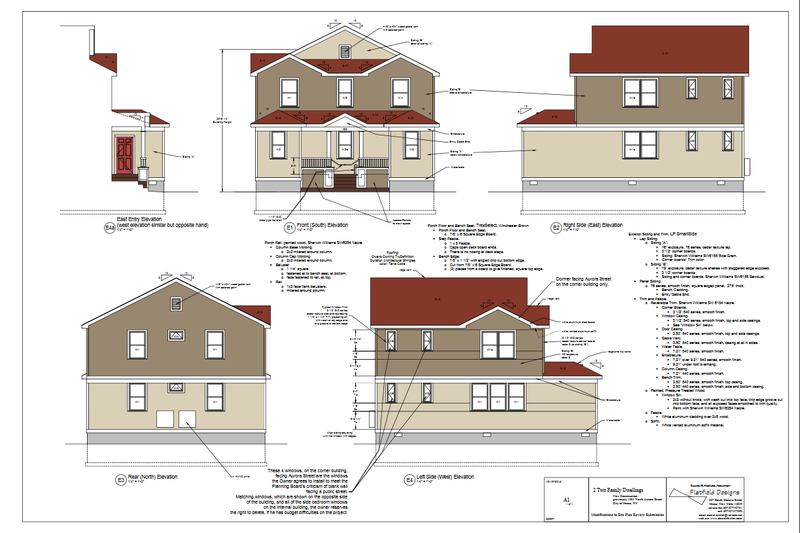 The nascent kit-based homebuilder plans to roll out several new designs, many of which will be incorporated into the 15-unit Varna project on the corner of Dryden and Freese Roads. That brings their total number of home design options up to about 21 or so, in several general styles from four-square to prairie-style to bungalow. It is not clear if the layout will be pre-set at is was with the Belle Sherman Cottages (relatable because STREAM Collaborative designed both), or if it will be left to the buyers. Tiny Timbers is a bit of a misnomer because the designs are a modest but still sizable 1,000-1,500 square feet, with two or three bedrooms. Prices will be in the mid 100s to low 200s, depending on unit and features. I’d be more inclined to compare them to the starter homes of the 1950s in terms of market appeal and affordability. Tiny Timbers has yet to get permission to start marketing for the community (the state needs to sign off on all new Home Owner Associations), but marketing has started for some scattered site development on Hector Street in Ithaca’s West Hill, and there is work underway on a few custom builds for landowners in other parts of the county. 2. Last week was not a good showing for the Inn at Taughannock. As relayed by the Times’ Jamie Swinnerton, the town of Ulysses Zoning Board of Appeals denied the lot variances, the heights variances and even the sign variances. The only one they outright permitted was the height variance to allow a rooftop cupola on the existing inn. The sign variance is kinda weird, because it sounds like they were okay with some individual signs, but not the sum of parts, so they’re doing another meeting. While this isn’t what owner/developer Carl Mazzocone was hoping for, there were alternative plans drafted that did present an alternative design that, while the same style, fit within the zoning parameters. So this is a setback, but this project isn’t off the table yet. 3. Sure, most readers outside the Cornell bubble avoid Collegetown like the plague, but it’s worth noting when new businesses are coming in. Old Mexico, the restaurant that replaced Manos Diner in Southwest Ithaca, will be opening a modest to-go operation at 119 Dryden Road (Collegetown Plaza) in what used to be a barbershop (at least in my time in the late 2000s). Meanwhile, where the Collegetown tobacco shop used to be at 221 Dryden (Collegetown Center), will now be a “Chinese street food” restaurant called Beijing Jianbing. Best of luck to both. At least restaurants aren’t being driven out of business by the internet anytime soon. 4. In the same vein, it was noted a few weeks ago that a $415,000 construction loan was filed for Hancock Plaza, the strip retail plaza at the corner of Hancock and Third Streets in Ithaca’s Northside. A quick check showed an interior renovation underway with new metal stud walls and sheet-rock going in, and the somewhat uncertain workers said that the storefront next to Istanbul restaurant would be a “medical service facility”. 5. Earlier this month, it was mentioned that a 4.5 acre parcel at 452 Floral Avenue in Ithaca was sold to a local homebuilder for $100,000. Now he’s trying to flip it. The asking price is $239,000. The tax assessment is $68,400. The real estate ad notes the potential of an R-3a zone, which allows for homes, townhouses, small apartments and small-scale commercial with a special permit. The zoning permits four floors and 35% lot coverage, with a minimum of 5,000 SF per lot for a home, plus incremental increases for additional units. On a side note, with thanks to the city for uploading about 470 documents from the IURA’s microfilm stash, here’s what the 1992 affordable for-sale proposal looked like for that same property. There appear to be 27 home lots, but a few may have been designed for accessory or two-family units. This gives an idea of what could reasonably be done under the existing zoning, but there are many possibilities. Side note, I found this by chance. If anyone has time to pick through 470 documents from the 1960s to 2000, more power to you. 6. Also for sale, to the deep-pocketed investor looking for a safe investment – multiple East Hill apartment houses. 5-unit 119 Stewart Avenue for $995,000, a two-family home at 208 Stewart Avenue for $695,000, and $2.25 million for a 23-bed (20 SRO, 1 studio, 1 2-bedroom) property at 717 East Buffalo Street. The Stewart Avenue properties are owned by a Long Island-based LLC representing a higher ed professional now located in Massachusetts, and were purchased just a few years ago – 119 for $625k in 2014, and 208 for $513k in 2012. 717 East Buffalo was purchased by a Brooklyn investment group in 2003, and is taxed at $1.05 million. The positive is that they’re close enough to Cornell to easily take advantage of the student market. The negative is that they are all in the East Hill Historic District, which means redevelopment is off the table, and exterior renovations have to go through the ILPC. 7. Pretty slow month for the Planning Board. Finger Lakes ReUse is seeking preliminary approval for their expansion project and final approval for the warehouse portion. 709 West Court Street, the 60-unit affordable project from Lakeview, will have its DEIS finalized, potentially allowing for city approval in September. There are no new projects though, unless one counts the six-bedroom duplex at 217 Columbia, which is so minor from the state’s perspective that it only qualifies for city review. The Times is reporting that O’Connor is willing to prohibit student tenants, but permanent residents are still opposed to new student housing in their neighborhood. There could be some interesting discussion at the meeting, not only with South Hill development, but with historic preservation matters. For instance, Student Agencies is upset that they city is likely to landmark its building at 413-415 College Avenue, which it says it had intent on redeveloping. Unfortunately, timing is everything. Likewise, the shoe is on the other foot with the Nines at 307 College Avenue, for which there has been an unpublished sketch plan of a redevelopment project. The ILPC is expressing frustration that it wasn’t landmarked already, but with the development plans already presented, the city would be acting reactively instead of proactively as it’s doing on College Avenue, and that could make the difference if a legal situation were to arise. So while the Chacona Block is likely safe and soon to be under ILPC purview, the Nines will not be protected for as long as the redevelopment plan is active, and the best the ILPC can do is recommendations. attached 4-story mixed-use building to include retail, office, and 22 units of transitional housing fronting Elmira Road. A 7,435 SF covered outdoor inventory building and a 600 SF pavilion are also proposed. The new parking and loading layout will reduce the number of curb cuts on Elmira road from 5 to 2 and provide 70 parking spaces. An improved sidewalk will be constructed to provide a safer link between the existing pedestrian bridge that connects the Titus Tower property to Elmira Road. The building will have landscaped entrances facing Elmira Road and these will be connected to the new building entrances giving residents and patrons arriving on foot direct access to the street. The project site is in the B-5 Zoning District and has received the required area variance. This is a Type I Action under the City of Ithaca Environmental Quality Review Ordinance (“CEQRO”) §176-4 (I), and the State Environmental Quality Review Act (“SEQRA”) § 617.4 (11) for which the Planning Board as Lead Agency made a Negative Declaration of Environmental Significance on June 27, 2017. Ed. note – the first phase is the warehouse addition for lumber storage. Phase 2 is the supportive apartments. The applicant is proposing to install a modular duplex with one 3-bedroom apartment on each floor. The new structure is proposed to be sited directly behind the existing duplex on the property. As the project will increase the off-street parking required from two to four spaces, the applicant is proposing to shift the existing curb cut to the east and install an expanded parking area and drive aisle along the eastern property line. The project also includes removing a 30”dbh oak and one street tree, closing the existing curb cut, installing a fence, landscaping and walkways. The project is in the R-2a Zoning District. This is a Type II Action under the City of Ithaca Environmental Quality Review Ordinance (“CEQRO”) §176-5 C.(8) and the State Environmental Quality Review Act (“SEQRA”) § 617.5 (C)(9) and is not subject to environmental review. A. 412 East State Street – review and sign off on Argos Inn shared parking agreement with 418 East State Street. B. PB Report on Proposed Local Landmark Designation of 403 College Avenue and 411-415 College Avenue . There will be a short presentation by Scott Whitham regarding 411-413 College Avenue.